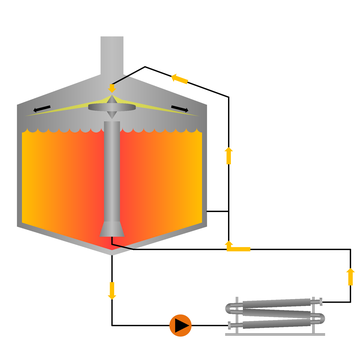 The wort boiling process is based on the same proven SmartBoil internal wort boiling system technology. Internal boiler systems require a minimum heating-fluid temperature for optimal boiling. If a low-temperature heating system is used, this minimum heating-fluid temperature is not possible, making the SmartBoil Ex the ideal wort boiling system. The wort is precisely and gently heated as it is pumped through the external heat exchanger. The heating surfaces are designed using specialized software for minimal CIP downtime. Over 50 brews between CIP cleanings are possible. Depending on available space, the heat exchanger can be installed horizontally or vertically to save space. The use of cone hops in the boil can also be implemented into the design. The combination as a mash-heater is also possible, making the SmartBoil EX especially interesting for wort and mash kettle modernizations. Wort is pulled out of the bottom of the kettle and is pumped through the external boiler. Until the wort reaches boiling temperatures, it is heated extremely gently under atmospheric pressure conditions. The controlled flow in the heat exchanger with a constant temperature difference ensures low thermal stress on the wort. Once the wort begins to boil, it is pumped up through the central riser pipe. The riser pipe pulls additional wort out of the kettle due to the Venturi effect. This creates a large amount of circulation in the kettle with low outlet temperatures. Homogenous wort handling and high evaporation efficiency is achieved.